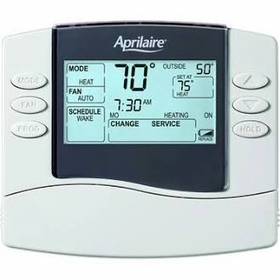 Easy to Use Temperature Control and ability to override the program schedule at any time. Progressive Recovery assures that the heating and cooling equipment starts at the optimum time to reach chosen temperature by the time you want it. Choice of 5/1/1 Day or 5/2 Day Programming. This allows for customization of your weekday and weekend schedule based on your needs. Large LCD Screen with high contrast - for easy reading. Outdoor Temperature Reading for convenience and comparison (requires optional outdoor temperature sensor). Circulate Fan Mode means your model 8400 series thermostat monitors your HVAC system to ensure the HVAC fan operates for some time every hour to provide better indoor air quality plus reduces hot and cold spots within your home. Service Reminder tells you when you should change your air filter to protect your equipment and water panel to keep your humidifier running in optimum condition. It also can remind you to service your equipment or whole-home dehumidifier to insure the longevity of your investment.